A TelVue Connect Media Exchange Syndicator uploads programs to share with Affiliate TV stations. Syndicators choose their own licensing terms, and will receive download reports on their content. Once your account is activated, login at connect.telvue.com. Org Profile. Take a moment to fill in some basic information about your organization, including your website and contact information, so Affiliate stations can know more about you. Go to the Administration tab, and click on Profile from the left nav menu. Choose your license. Before you start syndicating your content, choose a syndication license. 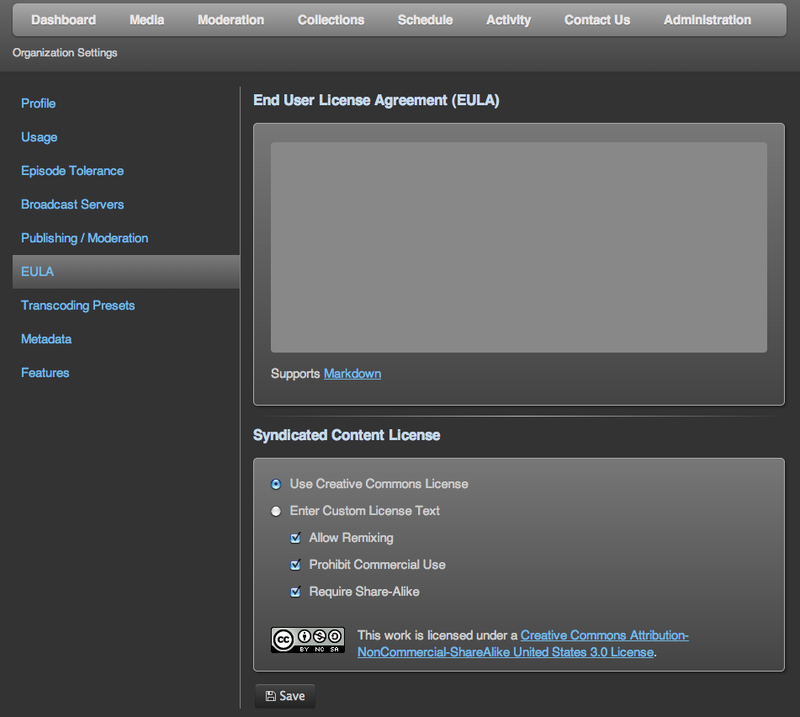 Go to the Administration tab, and click on EULA from the left nav menu. The lower EULA field is where you designate your syndication terms. You have a choice between several versions of the Creative Commons License — or if you choose “Enter Custom License Text”, you can enter your own licensing terms. Any station that wants to download your content will be prompted to accept your licensing terms before they can proceed. After that, these same terms will apply to ALL your syndicated content. First, click on the Media tab, then upload videos to your own TelVue Connect media library by dragging and dropping the files onto your Media page. TelVue Connect accepts bulk uploads too. TelVue Connect accepts all the most commonly-used video formats, in SD or HD. Just make sure your content is broadcast-quality. Add metadata by clicking on the “Edit” option in the pulldown menu to the right. At the very least, you need to fill in the Title and Short Summary fields, as this metadata will transfer, along with the video, to any Affiliate that automatically distributes your content to their broadcast server. Read more about metadata guidelines. by checking the media on the left of the media library page, and then choosing “Syndicate from the pulldown. More detailed instructions here. If you want to Syndicate a Series (that is, episodes of equal and predictable length), you can first create a Series, and then fill it with Episodes. Then, when a station subscribes to your Series, each new Episode will automatically show up in their Media Library. 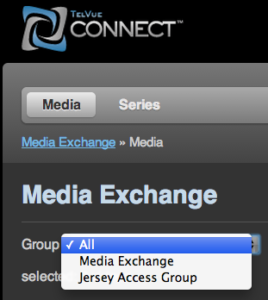 Private Groups are visible only to the members of that group, and can be accessed from the Group pull-down menu under the Media Exchange tab. To browse within your group, just select the group name from that menu. To add media to a Private Group: Users of a Media Exchange Private Group will see an “Edit Syndication” choice on the Actions menu beside each media entry. Edit Syndication gives you a popup checklist, allowing the Syndicator to decide whether to add this video to the public Media Exchange, or to any number of Private Groups to which this user belongs. The TelVue Connect Media Exchange will make sure that the downloading stations get a version of your content that is automatically transcoded to their broadcast specs. So you don’t have to worry about creating separate SD or HD versions for different stations, or mpeg2 vs. h.264. It’s all done for you, in the TelVue cloud. Once your content is uploaded, feel free to publicize it through whatever channels you usually use to reach your TV collaborators. Participating stations will have to register with TelVue in order to access the Media Exchange. When publicizing your content, you can ask people to fill out the TelVue Connect Media Exchange registration form here, and TelVue will create an Affiliate account for them. To see which stations have licensed your content, please refer to Syndication Reports. New content in the Media Exchange automatically displays in the #mediax channel in Slack, a real-time messaging app for both desktop and mobile. Sign up to join the telvuegroup in Slack, and you’ll be able to add comments and join discussion threads about your programs with Media Exchange Affiliates. If you are interested in becoming a Syndicator, please email sales@telvue.com.